We classify Southern Arizona as Casa Grande south. This area includes Tucson, Green Valley, Tubac and Rio Rico. Like the Phoenix metro area, all towns are within close proximity to each other, with your longest drive being from Tucson to Rio Rico, about 40 minutes. This area of the State provides a little cooler weather all year and a much slower-paced atmosphere. But like its big sister, it provides just about any type of golf experience you desire, from great resort courses to challenging municipal options and everything in between. Casa Grande, located half-way between Phoenix and Tucson, is home to 40,000 residents and one of the longest golf courses in Arizona, a 7,400 layout boasting 15,000 mature trees. It’s worth the 45-minute drive from Sky Harbor Airport in Phoenix to stay at the Francisco Grande Resort for a night or two. This historic property was originally built to serve as Horace Stoneham’s San Francisco Giants Spring Training Complex and offers a comfortable stay, good food and a great golf experience. A visit to Tucson, Arizona’s second largest city, will provide a very different experience from its big sister to the north. Tucson is much more laid-back, rustic and charming. It’s proximity to the Mexico border brings a wonderful influence to its architecture and cuisine. The Tucson area has a plethora of golf resorts, including Hilton Tucson El Conquistador (45 holes), Loew’s Ventana Canyon Resort (36 holes), Omni Tucson National (18 holes), Westin La Paloma (27 holes) and the Ritz-Carlton Dove Mountain (18 holes), which are all located in the north section of town. JW Marriott Starr Pass Resort (27 holes) is closer to downtown, while Tubac Resort (27 holes) and Esplendor Resort (18 holes) require a longer drive as they are located south of the City. All of these properties are within 20 minutes or less of each other, so you can pick your spot and enjoy them all. In addition to the resort experience, Tucson offers every other type and variety of accommodations, from national chains, motels and B&Bs to guest ranches and extended-stay facilities. If you pick on in the downtown area, you’ll be close to great muni options including Dell Urich, El-Rio Trini Alavarez and Fred Enke. Just east of Tucson is Green Valley, a community nestled at the base of the majestic Santa Rita Mountain Range in southern Arizona’s beautiful Santa Cruz Valley. Known as one of the country’s best places to retire, Green Valley sits at a high desert elevation of 2,900 feet, so the climate is cooler than Phoenix or Tucson. 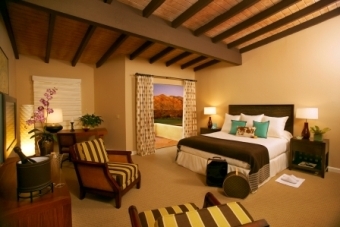 Lodging options include the Inn at San Ignacio and Wyndham Canoa Ranch Resort, both of which have golf on property. The town also has a Best Western and Comfort Inn. All provide easy access of many golf options, including Canoa Hills, Torres Blancas, Haven and San Ignacio (public tracks) and Quail Creek, Desert Hills, CC of Green Valley, Canoa Ranch Golf Club (private facilities).